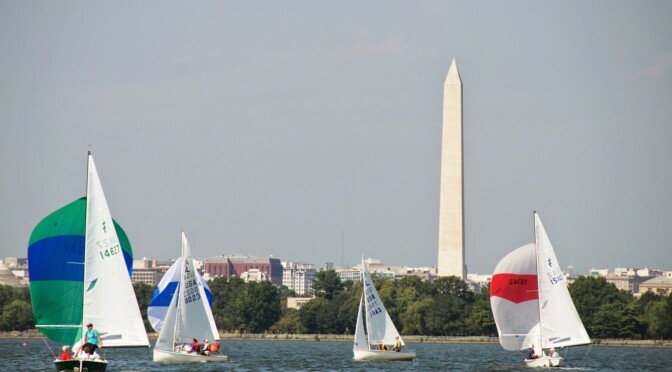 The 2015 PRSA President’s Cup Regatta, sponsored by Annapolis Performance Sailing, will be held September 19 & 20 at Washington Sailing Marina, continuing the long tradition of competitive one-design racing started by the President’s Cup in 1934. The regatta will be sailed on the Potomac River on two courses. One-person dinghies (Lasers, El Toros, Penguins) will race on Saturday in the cove near Washington Sailing Marina (WSM) or off of the power plant just south of WSM. Other classes (Albacores, Buccaneers, Catamarans, Flying Scots, Lightnings, I-20s, etc.) will race Saturday and Sunday on the north course between Hains Point and Gravelly Point (with the Capitol and national monuments as a backdrop). Register now for the 2015 President’s Cup and view the NOR and other race information. Registration fees increase after September 12, so make sure to register and pay online before September 12 to save yourself a bit of cash! Special thanks to Annapolis Performance Sailing for sponsoring the regatta and providing some additional prizes. This year we will also have a spectator boat – the schooner American Spirit – thanks to the generosity of DC Sail and the National Maritime Heritage Foundation! Make sure to tell your friends and family about this fantastic opportunity to view the sailing from the water on Sunday, Sept. 20. 2013 President’s/Leukemia Cup: Great Wind, Great Racing, and a Great Celebration! What a fantastic weekend! We were pleasantly surprised with great breeze on both Saturday and Sunday, we had tight racing on both the upper and the lower courses, and we had great celebrations after the racing on both Saturday and Sunday. The folks on the lower course got 6 races on Saturday, and on the upper course we had 4 races on Saturday and 3 more on Sunday. All told there were 61 boats on our PRSA one design courses (14 Lightnings, 12 Albacores, 10 Cats/Scows, 7 Bucs, 7 El Toros, 4 Flying Scots, 4 Lasers, and 3 Penguins). You can’t ask for anything more in a regatta! Many PRSA sailors also supported the Leukemia & Lymphoma Society through fundraising efforts and through their own contributions. As we went into the regatta weekend the fundraising total was trending towards $160,000+ and many sailors made generous donations at registration over the weekend. I’ll be sure to send along the final totals on the fundraising efforts once those figures are available from the LLS. In the meanwhile, a huge “thank you” on behalf of the LLS to all of you who contributed to the fundraising effort. Keep reading for links to scores as well as for some of my observations from the upper course. Be sure to add in your own comments and recollections as well!